Turbine-powered cruiser of the future travels on either highway or waterway. SOME DAY in the near future a long, sleek car with a bubble canopy will drive down to the water’s edge and then splash right in. Once afloat, its wheels will retract and the driver, shifting from gears to a jet thrust; will become coxswain of a speedy family cruiser. This strange new vehicle will be the car-boat. Propelled by a gasoline turbine engine it will skim over highways at better than 90 mph and reach a top pace afloat of nearly 50 mph. The cabin will serve up air-conditioned comfort for its passengers and offer the riding ease of today’s luxury cars. 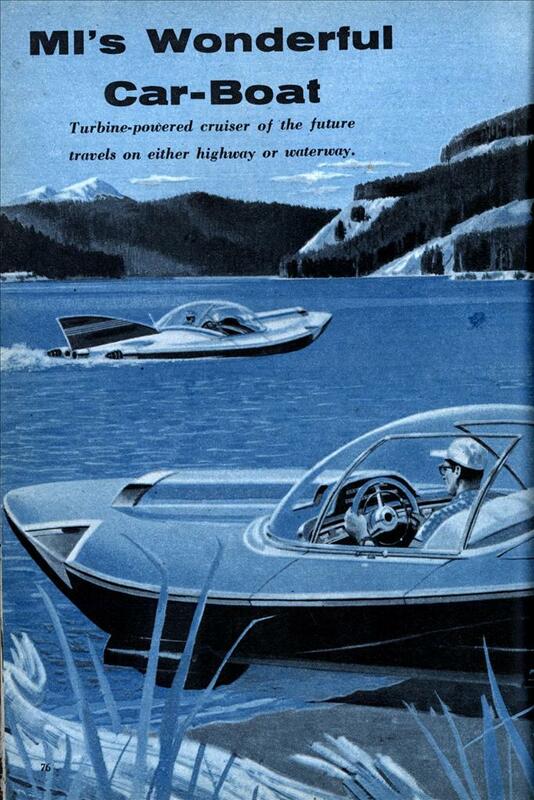 The arrival on the market of a practical, efficient car-boat now appears imminent. This split-personality cruiser has never quite made the grade to date because of a multitude of engineering problems. They began with the power plant and extended into transmission and methods of shifting power from wheels to prop. The need for good watertight shaft and grease seals complicated matters further. Several companies are experimenting with land-water buggies and most major roadblocks now have been cleared away. Bassons Industries of Yonkers, N.Y., a plastics concern, is concentrating on a smallish vehicle resembling its new postman’s-helper car. Custom Hydrocraft of San Diego is working under the theory that the craft should be closely related to the car. The firm’s prototype Hydromobile has three retracting wheels, uses a standard auto engine and has done 85 mph on land and 30 on water. In preparing its car-boat design MI has made the body molded Fiberglas for easy construction and repairs. Overall length is 20 ft. and the beam measures 6 ft. A dual-light system includes headlights for road driving and the red and green markers necessary for marine travel. Just aft the cabin is a radio aerial-flagstaff topped by a 360-degree white navigation light. A scoop on the bow furnishes fresh air to both cabin and engine, which is accessible through a hatch. Basic marine navigation instruments are mounted on the dash along with automotive gauges. Watertight flaps close over the retracted wheels for streamlining and pumps evacuate the water inside. “MI’s Wonderful Car-Boat” Modest, aren’t they. Well, they’ve done the hard part by drawing a picture of it. Now all it needs are some engineers to figure out a few details like how to make it work. Captain Action had one of these babies! When I was a bit younger I wanted to try to break the amphibious circum navigation record. I even found a couple of DUKWs for sale. My wife would have nothing of it though. Amphibious vehicles had been around for quite a while before this article it just they are expensive and are not the best at being a car or a boat. Not for me…it doesn’t fly. 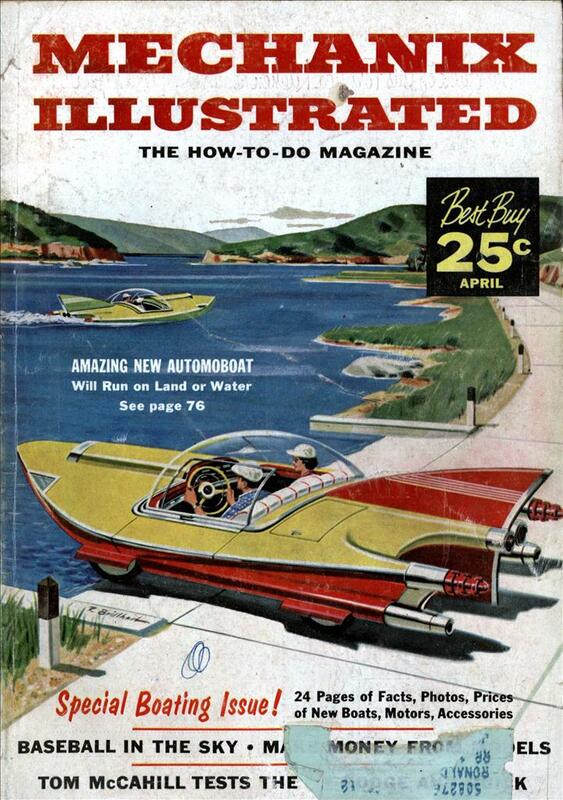 Somehow science fictional or futuristic boats have never really gotten any traction in the popular imagination. Even hydrofoils are something of a cheat: Hey, let’s get the boat mostly out of the water. Back in the 60s I recall seeing a small car on the road with little props sticking out of its rear end a couple of times. It was some kind of amphibian for consumer use. In fact LBJ had one on his ranch in Texas. He used to drive unsuspecting visitors around on a tour of the ranch and then suddenly swing into the Padernales River which runs through the ranch. Got his jollies that way I guess. Strange guy. There are Amphicar clubs around the US that regularly meet. Well hell, if I can’t get an aerocar or a rocket pack, I guess I can settle for am amphicar. I don’t like it, but I can live with it.